Maximum size: 114 mm (Hoover, 2006). Identification: This is an elongate species covered with very small tubercles. The body is cream blotched with brown and there are rows of stellate white patches along the sides of the notum (usually with the dorsal two rows being the most prominent). Young animals may lack obvious tubercles and stellate patches. Natural history: Dendrodoris elongata is a moderately rare species found in rocky habitats at depths of 2-52 m (6-170 ft). It occurs at moderately exposed to highly exposed sites and lays a cream egg mass. Distribution: Big Island, Maui, Oahu and French Frigate Shoals: widely distributed in the Indo-Pacific; also in the Eastern Pacific. Taxonomic notes: This species is listed as Dendrodoris albobrunnea in Hoover, 1998 & 2006. It was first recorded in Hawaii at Koko Head, Oahu by Scott Johnson on Oct. 31, 1977. 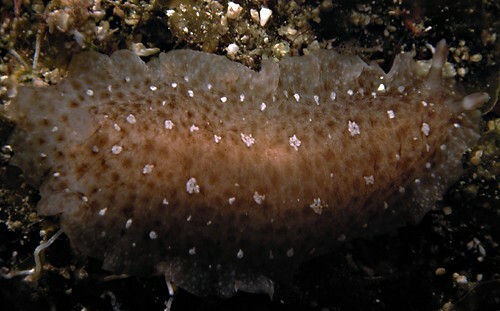 It's referred to as the "white and brown dendrodoris" in Hoover, 1998 & 2006. Photo: Mike Severns: 40 mm: Molokini Islet, Maui; Sept. 1987.